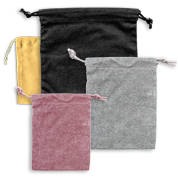 Shop elegant faux suede drawstring pouches for your jewelry collections! Find quality yellow pieces, perfect for packing rings, bracelets, small charms, necklaces & more! Get the best deals thanks to our bulk sales & discounts!